InsiteVR is virtual reality meeting software for coordination and constructability reviews.This add-in for Autodesk® Navisworks® Manage and Autodesk® Revit® enable one-click virtual reality (VR) meetings from existing projects. 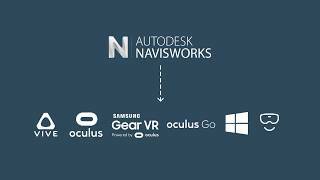 With a single click, project teams can review their Navisworks and Revit models in virtual reality devices like the Oculus Go, Oculus Rift, HTC Vive, GearVR, and Windows Mixed Reality headsets. Once a project is synced to InsiteVR, users can review projects together in virtual reality multi-user meetings. Just like with GoToMeeting a link can be shared to enable everybody to hear and see each other in a VR environment. Users see avatars with their names above them as they explore the model together and inspect issues. InsiteVR will import Navisworks layer and Revit category information so that teams can also turn specific elements on and off and review the model across different disciplines or remove obstructions. With InsiteVR’s speech-to-text annotations all issues found in VR can be easily tracked - users simply say something out loud and the software will transcribe their speech into text that can be placed on a specific object and reviewed after the meeting. Similar to Navisworks’ report functionality, InsiteVR can create PDF reports of annotations and screenshots captured during VR coordination meetings to ensure meeting action items can be tracked and resolved. To start a trial create an account via the app and then click "Start Free Trial" on the top banner.